PALM SPRINGS, Calif. – Five former California Winter League players have been named 2018 Frontier League All-Stars. First baseman Jacob Wark, second baseman Jack Parenty, catcher Mike Jurgella and pitchers Payton Lobdell and Jack Landwehr will all take part in the event. Wark, Parenty, Landwehr and Lobdell will be competing for the Rookie squad while veteran Mike Jurgella will see action for the Experienced team. Jacob Wark competed in the CWL in 2018 with the Oregon Lumberjacks, hitting .355 with 3 home runs over the course of the season. Wark signed with Lincoln of the American Association before signing with the Florence Freedom in the Frontier League on June 2nd. In the Frontier League this season, Wark has hit .290 with 6 home runs while driving in 26 runs. He will compete in the Home Run Derby. Jack Parenty competed in the 2017 California Winter League as a member of the Lumberjacks before being signed by the Schaumburg Boomers. In 2018 with the Boomers, Parenty has hit .309, stolen 8 bases, and walked 30 times against just 20 strikeouts. Mike Jurgella participated in the 2016 CWL season as a member of the Washington Blue Sox and caught on with the River City Rascals. This summer, Jurgella is hitting .254 with 3 home runs and 27 RBI. Right-hander Payton Lobdell compiled an impressive 31 strikeouts in 21.1 innings pitched as a member of the Palm Springs Power during the 2017 CWL season. Those numbers were good enough to receive an offer from the Southern Illinois Miners. In 2018 as a member of the Schaumburg Boomers, Lobdell has compiled a 2.68 ERA over 50.1 innings pitched. Jack Landwehr, a member of the British Columbia Bombers during the 2018 CWL season, compiled a 2.94 ERA with 19 strikeouts in 19 innings pitched before being signed by the Normal CornBelters. With Normal this summer, Landwehr has pitched to a 2.86 ERA with 35 strikeouts and just 8 walks over 44 innings pitched. The Frontier League All-Star game takes place July 11th at CarShield Field in River City. All-Star festivities get started with the Home Run Derby on July 10th. Entering its 10th season, the 2019 California Winter League season will begin with players reporting to Palm Springs, CA on January 21st and departing on February 18th. The CWL is now the Exclusive Winter League of the Frontier League and offers players the best possible opportunity to play in front of MLB scouts and independent league managers to start or continue their professional careers. For more information on the Frontier League All-Star game, visit www.FrontierLeague.com. 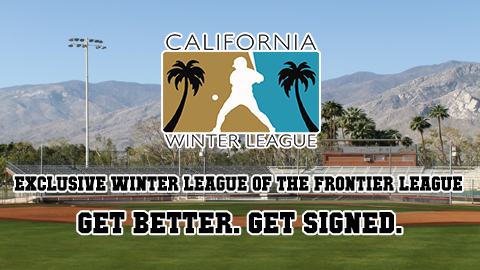 For information on how to participate in the California Winter League, visit www.CaliforniaWinterLeague.com.